i.d. 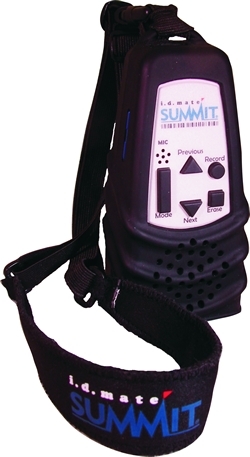 mate Summit is a portable “all-in-one” talking bar code scanner that aids visually or print impaired individuals with the identification of items via the product’s bar code or UPC. Using text-to-speech and digital voice recording technologies, it allows users to access an on-board database of product descriptions, along with a tailored set of recorded voice messages. With i.d. mate Summit, the user can quickly add additional voice recorded information to existing products or to items not found in the database. Additional bar code labels are available to label any product or item that does not already have a bar code. Adhesive, tag, and clothing labels can be placed on nearly anything. Simply scan the bar code and add a voice recording. i.d. mate Summit contains the largest database available – multi-millions of items! It comprises a wide variety of products such as grocery, wines & spirits, over the counter drugs, health & beauty products, cleaning supplies, pet supplies, hobby items, hardware items, DVDs and CDs, bulk supplies, and much more! Extended information is included for many items. Listen for nutritional information, ingredients, cooking instructions, allergen warnings, directions, package size, song tracks, detailed descriptions and more. We continually add to and update the database, increasing items and product information to benefit our customers. Users can stay current with an updated database release every six months. You don’t have to know where the bar code is. Simply move the scanner around the product to get a quick and reliable read. Measures only 6 inches long and weighs just 7 ounces! A standard SD card allows hours of recording and easy user firmware updates. User can record, play and erase memos and messages. Count, record, edit and manage product inventory on the go and upload data to a computer. Use for a myriad of jobs and tasks. Create your own database for your business, hobby or collections. A rechargeable high-capacity lithium battery gives many hours of continuous use. Have a question? Need some help? On-board answers are just a button press away.